Jon Bon Jovi spent his 21st wedding anniversary doing what he does best - performing. The rocker was the entertainment for Thursday's gala for DKMS, which helps find bone marrow donors for leukemia patients. 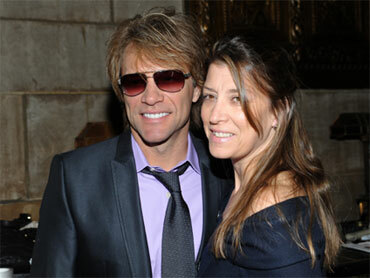 Bon Jovi was there with his wife, Dorothea. He sang some of his band's biggest hits, including "Livin' on a Prayer." Bon Jovi says he didn't mind "singing a song to help lighten the load for a minute." Island Def Jam Chairman Antonio "L.A." Reid was honored at the event, which raised more than $1.7 million. Halle Berry was also there. She says she's waiting for the chance to be a bone marrow donor. She says: "Being a mother, I know the importance of saving the lives of our children ... I hope I get that phone call."